Dental phobia and anxiety can prevent many patients from seeking the dental care they need. Hover, avoiding regular treatment can have devastating effects on their oral health. It is of the utmost importance that you undergo necessary care to prevent further damage, decay, or more costly procedures in the future. Fortunately, at Peak Family Dental Care, we provide sedation dentistry so that our patients can relax during procedures. Sedation can benefit many patients including children, special needs patients, or those with claustrophobia. Drs. Bryan J. Shanahan and Ryan Tuinstra can administer oral conscious and nitrous oxide for most procedures. We also work with a local dental anesthesiologist to provide intravenous (IV) sedation at our practice in Cottonwood and Flagstaff, AZ. Your best interest is our priority, and we provide gentle, compassionate treatment in the most comfortable environment possible. Sedation dentistry uses anti-anxiety and other sedative medications to complete dental procedures. Sedation can be used to help patients relax during treatment and each type of sedation has different effects. We offer our patients three types of sedation. Also known as laughing gas, nitrous oxide is administered through a comfortable mask. You will continuously inhale nitrous oxide throughout the procedure to maintain relaxation. Our doctors can safely control the level of sedation so that you can communicate and follow instructions, remaining fully alert but calm. Nitrous oxide will enter and leave your system very quickly. Oral conscious sedation requires you to take a prescription anti-anxiety medication prior to your procedure. You may experience light or moderate sedative effects, depending on the dose taken. You will remain awake during treatment, but will typically remember very little about the procedure. Depending on your unique circumstances, you may take your oral sedative as early as the night before your procedure or just 30 minutes to an hour prior. You can discuss what dosage, amount, and time would be best with your doctor during your consultation. 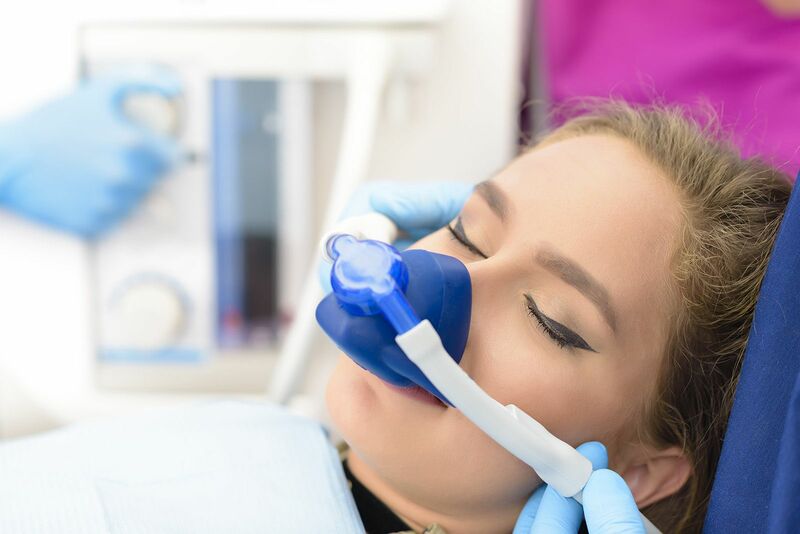 While our doctors can provide nitrous oxide and oral conscious sedation, we bring in an experienced dental anesthesiologist to administer IV sedation for the safest treatment possible. A precise amount of sedative medication will be administered directly into the blood stream. This form of sedation induces a deep relaxation and typically patients will not remember their procedure. Gentle, safe sedation can help you relax and remain comfortable during your treatment. Sedation will relieve your anxiety and fear of discomfort, but does not relieve pain. To ensure your comfort, we will also provide a local anesthetic. Local anesthesia is typically injected at the procedure site to prevent sensation in that part of the mouth or face. Sedation and a local anesthetic are typically paired together for optimal results. The safety of our patients is very important to us. If you are planning to undergo oral conscious or IV sedation, you will need to arrange for a family member or friend to drive you home from your appointment. You should avoid operating any heavy machinery for 24 hours and contact us in the case of any side effects. By allowing patients sit comfortably during their procedures, sedation can make visiting the dentist easier and allow you to regularly maintain your oral health. This proven technique can also help those who need to undergo multiple treatments in one visit or lengthy procedures such as dental implant placement. Your doctor can help you determine if you or a loved one should receive sedation and which type will be best suited. Pain is not an option for our patients. We believe that dental appointments can be a positive experience when the right measures are taken. In addition to sedation and local anesthetic, our doctors and entire team are devoted to making your feel comfortable throughout your entire visit. For many procedures, we can use the Solea® laser to provide gentle, virtually painless care. The Solea laser can replace the need for a dental drill, eliminating painful vibrations and friction as well as harsh sounds. Laser dentistry has allowed us to complete procedures without the need for anesthesia or sutures, reduce treatment times, and significantly improve your overall experience. If you would like to learn more about sedation dentistry and the types we offer, contact us online or call us today at (928) 774-2500. We are committed to treating our patients as we would our own family members through comfortable, anxiety-free care.